MAG*I*CAL® is the world's smallest ruler and have been inducted into the Guinness Book of World Records. In the diagrams of the MAG*I*CAL® grid located above, the arrows point to the four regions containing the calibration marks. 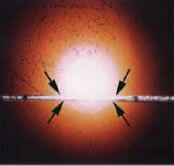 MAG*I*CAL® consists of an ion milled cross section of a silicon single crystal consisting of a series of atomically flat layers of Si and SiGe, which have been grown epitaxially by MBE (molecular beam epitaxy). 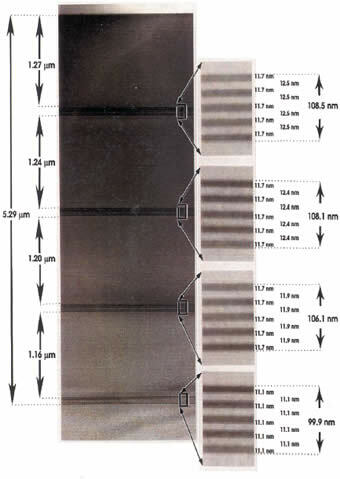 When the calibration structure is viewed in a TEM, it appears as a series of light and dark layers where the layer thicknesses are accurately known. The calibrated thickness measurements of these light (silicon) and dark (SiGe) layers are based on careful TEM measurements of the <111> lattice spacing of silicon, which is visible on the calibration sample itself, and are supported by x-ray diffraction measurements. The layer spacing are designed so that the sample can be used to calibrate the entire magnification range in a TEM, from 1,000X to 1,000,000X. As the sample is also a single crystal of silicon, the calibrations requiring electron diffraction information such as the camera constant and image/diffraction pattern rotation can also be performed easily and unambiguously. One single calibration sample can therefore be used to provide all three of the major TEM instrument calibration at all magnifications and all camera lengths.